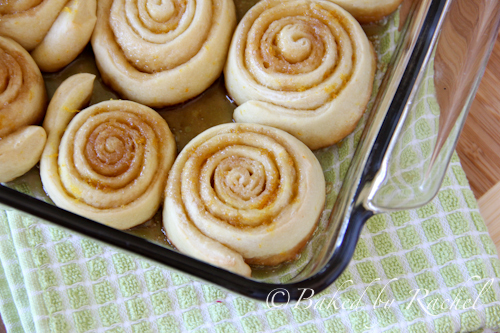 Orange rolls bring back fun memories of Christmas past. I’m not entirely sure that it was a yearly tradition but somewhere along the line, that’s what my brother and I believed it to be. We’d wake up to overflowing stockings and eventually move on to breakfast once our parents woke up. This is probably the only day of the year we were ever up before our parents. Something about knowing there was a stocking full of goodies and presents under the tree made us wake up at the crack of dawn ready to go. Orange rolls became a favorite of ours. 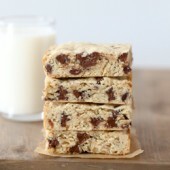 They were quick, warm and sweet… perfect for a cold Christmas morning. Back then we cheated and used canned orange rolls, which made them ideal for a house with kids claiming to be starving and wanting to dive head first into new toys… not the strange fuzzy sweatshirts and other peculiar items to throw us off during the present snooping moments weeks earlier. Yeah I was totally one of those. I still have a love for popping those tubs of rolls open. It’s weirdly fun. And yes, I still love them in a pinch. I’ll take my girls out of the way to find them to enjoy on Christmas morning as a continued tradition. 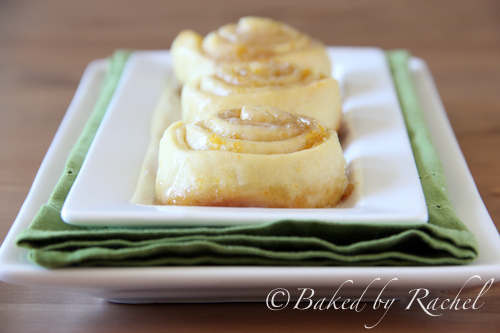 I’ve made homemade orange rolls in the past but this was another nice version to try. This week, Megan, chose Ree’s orange sweet rolls for us to make. The original recipe feeds an army. I’m not even joking. I quartered the recipe and ended up with 9 rolls that were all gobbled up the moment I was done taking pictures. I did make a bunch of alterations and I’ll note those below. I’m happy I’ve tried this recipe. They were perfectly sweet and not crazy over the top like some of our previous recipes. I’d say the biggest wow factor was the quantity they were to make. Cut it back and do some slight alterations and you’ve got yourself a tasty breakfast treat. A sweet version of your favorite cinnamon roll, flavored with orange zest and a drizzle of icing. -I quartered this recipe, making 9 rolls in an 8×8 baking dish. 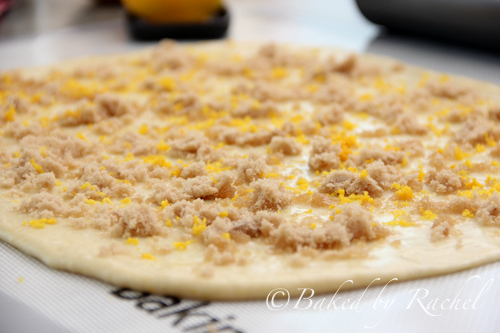 -I added zest to my dough for more orange flavor, which the original recipe didn’t call for. It just felt right to me. -Instead of oil for the dough, I used butter. I wasn’t sure I had enough oil since I mostly only use it for frying. Butter on the other hand, I always have around. -I mixed my dough together in a way I’m more comfortable with, allowing the yeast to activate in the warm milk and half of the sugar to feed on. Wet ingredients to the dry while the mixer was going. -I had to add extra flour to my dough because it was so wet and sticky there was no way it was going to roll after the rising period. An extra 1/2C (to my quartered recipe) did the trick. -I skipped the marmalade and salt for the filling, instead just doing butter, brown sugar and lots of zest. -For my icing, I kept it super basic using only powdered sugar and orange juice. I skipped the zest (feeling it wasn’t necessary with all of the other orange flavor I had going on), salt, milk and butter… because it was already the perfect consistency for me. 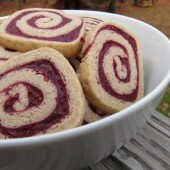 -And lastly… I didn’t coat the entire batch of rolls with icing. Instead, I drizzled each lightly when serving them. This allowed me to decide how much each person really needed. They were already moist enough and the kids certainly didn’t need a complete sugar loaded roll. Clearly I can’t follow directions BUT I really liked how these turned out and would definitely make them again with the alterations made or use the general flavors and match it with a dough that puffs up more. I’d never heard of orange rolls before this post and now I can’t stop thinking about them. What a wonderful alternative to cinnamon! I like your adaptations. These look great! What a coincidence, I was just thinking about making cinnamon rolls today. Maybe I should do orange instead!! Rachel, these are PURE perfection. I need them immediately. I love cinnamon rolls, this looks like a fun little twist with the orange! I really like the orange in these rolls! The zest is a great idea. I can never get enough citrus flavor! I think your alternations sound really sensible and I like that they’re not completely laden with sugar. those look outrageous! i love the flavors! This is the only recipe I’ve tried out of the book so far. I have to say, I like your alterations better than mine. I tried making mini rolls in a muffin tin. Bad idea. They got stuck! But even if I’d made them bigger, I still like not putting the marmalade in. It was sooo sticky and messy to cut the rolls. Yummy, but a disaster to clean up. I feel like mine turned out a lot harder than everyone else’s..i definitely left mine in the oven too long haha, yours looks super light and fluffy too! and I loved your alterations, thank you for sending those along to me :) helped me make mine a success!! Your alterations look great! They really look fabulous!!!! Mmm, orange rolls! I always say I’m going to make them on Christmas morning but then the excitement of the day takes over and we all eat candy instead. Whoops! I’ve never had orange sweet rolls. Looking at these that may change real soon. Delicious! 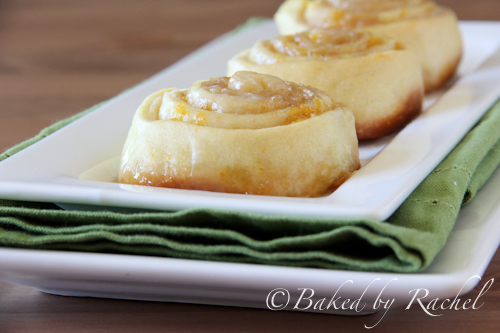 Orange rolls are one of my favorites. These look wonderful! These look absolutely perfect! I’ll have to try this with your adaptations over the weekend!